It was timely that BATTLESPACE Editor Julian Nettlefold made our annual visit to Spectra for an update on their latest technology in April. 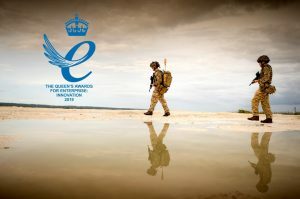 The Editor was greeted with good news on arrival, Spectra Group (UK) Ltd has been named as one of the awardees of the 2019 Queen’s Award for Enterprise in the Innovation category, a much-deserved award. SlingShot is an innovative system that uniquely converts UHF and VHF radios to L-Band Satellite frequency, extending the range to BLOS (Beyond Line of Sight). 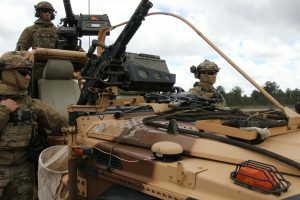 Conceived and designed in response UK MoD requirements, SlingShot offers a number of benefits for those engaged in high tempo operations, and that require reliable and robust COTM (communications on the move). SlingShot is a unique low SWaP system that enables in-service U/VHF tactical radios to utilise Inmarsat’s commercial satellite network for BLOS COTM. Including omnidirectional antenna for the man, vehicle, maritime and aviation platforms, the tactical net can broadcast over thousands of miles between forward units and HQ locations. In addition to C2 voice, the system enables data capability supporting mission critical applications such as; Chat, File Transfer, artillery fire missions, Situational Awareness and the Common Operational Picture,. With increased benefit to traditional TacSat, increased channel availability and almost no increase in the training burden, SlingShot is redefining tactical communications. SlingShot works with existing tactical military radios and requires minimal additional training to provide BLOS communications without the need for supplementary infrastructure or additional cumbersome equipment. SlingShot supports the majority of in-service tactical radios and has already been operationally proven. Combined with Inmarsat’s L-TAC leased service, it is fully flexible and designed to meet security and reliability requirements cost-effectively. Users can lease the service for periods as short as one a week in either narrow spot beams or beams customized to meet their area of operations. “How did the concept of SlingShot evolve?” The Editor asked Shaun Barry, Spectra Business Development for AsiaPacific and UK. 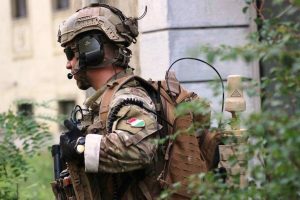 “SlingShot is now in operation across the World including the US, Canada, UK, Australia, France, Belgium and South Africa, It is used predominantly by Special Forces but also by Conventiontial Forces and other NATO countries. SlingShot, has Manpack, Vehicle, Maritime and Aviation systems, meaning that command and control of all personnel, no matter where they are deployed, becomes notably easier. To date the total number of systems shipped is in excess of the 3000 mark, further endorsing Spectra’s dominant position in the Tactical SATCOM market place. We are also actively pursuing opportunities in other regions where the service is yet to be utilised. AEWE is the US Army’s premier venue for small unit modernization, providing capability developers, the Science and Technology (S&T) community, and industry with a repeatable, credible, rigorous, and validated operational experiment, supporting both concept and material development. The AEWE is an annual campaign of experimentation to place cutting edge prototype technologies into the hands of Soldiers to solve small unit tactical problems. The Manoeuvre Battle Lab, as part of the Army Futures Command (AFC), executes AEWE to accelerate near and midterm Army modernization and provide bottom up input to capability development, by providing early and iterative feedback on prototypes in a tactical setting. AEWE is the ‘first step’ of a larger Army and Joint Experimentation enterprise. Being demonstrated at AEWE, Spectra’s SlingShot added voice and data BLOS COTM to the service participant’s in-service tactical VHF and UHF radios, allowing interoperability between coalition partner radios. Shaun further stated that SlingShot is a Force Enabler, providing man-portable, vehicle, maritime and aviation-borne systems, useable on the move, delivering flexible and low-cost channel leasing and with minimal increase in training-burden, SlingShot really does redefine tactical communication capabilities. Simon Davies, President of Spectra Group said, “It’s an important and prestigious step for Spectra Group to be selected to take part in the US AEWE 2019. Our SlingShot system is already in service with the world’s premier forces and it has been battle-proven on multiple occasions. AEWE provided an excellent opportunity to show case SlingShot’s unique, widespread, operational capability which is attracting increasing attention from the other potential US users. Setting up the US office enables us to provide closer support to our in-country partners and also to the end – users. “Our aim is to provide the Operationally Proven Go-To Tactical Satellite (TacSat) system for front line troops. Reliable C3 of units that are often widely dispersed and in austere environments is essential to mission success. Deploying and protecting terrestrial repeater stations in order to extend radio range is an expensive and sometimes impractical option, so military forces have tended to rely on Ultra High Frequency (UHF) TacSat communications. A limited supply of UHF TacSat channels, and its cost, means there was a need for a new solution. Without SlingShot, Force Projection troops have limited C3 capability, troops are able to communicate intra Patrol, and back to Company HQs but find it difficult to communicate effectively further back. 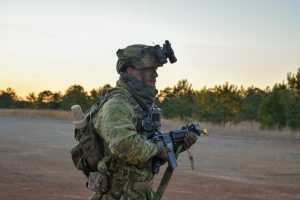 Equally remote units such as Recce troops find it difficult to remain in communications other than relying on more strategic systems such as HF. This also limits the ability of the troops on the ground to communicate with other platform types such as helicopters, fast jets and ships to call in air cover and artillery support. SlingShot provides for an all informed, platform agnostic approach, where helicopters carrying the first wave of troops can communicate with HQ and air support as they insert. Giving real time C3 across the battlespace. There is little doubt that Spectra’s Queens Award for Innovation is a richly deserved accolade for a UK company operating at the forefront of international satcom technology. The Trump administration recently released its FY 2020 budget. In it, the administration proposes to continue DOD’s role in border security, a role that includes both construction and troop deployments. Because this is nontraditional and controversial, the funding mechanisms in both FY 2020 and FY 2019 (the current fiscal year) are complicated. This set of critical questions explains the different mechanisms the administration proposes to use. Q1: What is in the FY 2020 DOD budget for border security? A1: The budget contains $9.2 billion for “emergency” construction funds in the Army military construction account. There are three budget lines: $2 billion for remediation of hurricane damage to facilities (primarily at the Marine Corps base at Camp Lejeune, but also at other bases such as Tyndall Air Force Base in Florida), $3.6 billion for further construction of the wall on the Southwest border, and $3.6 billion to backfill FY 2019 construction projects that were canceled to fund the wall. These are structured as “transfer funds”. Transfer funds do not identify specific projects but rather are appropriated as lump sums that DOD would transfer to other budget lines when the specific needs become clearer. They are structured this way in FY 2020 because the department does not yet know exactly which projects are needed. Congress does not like transfer funds and often criticizes them as “slush funds” because it does not know where the money will ultimately go. It is, therefore, unlikely that Congress will approve them in their current form. Instead DOD will likely identify the specifics by the time the committees go into markup, so funding can be approved for individual projects. Q2: Hurricane remediation and wall construction are clear. What is the backfill about? A2: The backfill in FY 2020 would pay for the $3.6 billion of construction projects that are projected to be canceled in FY 2019. Building a border wall has been one of President Trump’s signature issues, linked to a broader set of policies and attitudes on immigration. When Congress refused to give the president the full amount he requested in FY 2019, he declared a national emergency. One of the powers that a national emergency gives the president, 10 USC 2808, is the authority to use unobligated military construction funds for emergency construction. “Unobligated” means funds have been authorized and appropriated in previous years for specific projects, but DOD has not yet signed a binding contract. In his February announcement, President Trump stated that he would get $8 billion for the wall: $1.375 billion in the FY 2019 budget bill, $3.6 billion from military construction, $2.4 billion from DOD counterdrug funds, and $600 million from a Treasury forfeiture fund. Ironically, DOD has not yet identified which FY 2019 construction projects will be canceled. In other words, the president took the step of declaring a national emergency and has endured significant political criticism as a result, but he has not yet taken advantage of the authorities the declaration gave him. Q3: Why three separate accounts? A3: In theory, there could have been just one transfer fund, but instead there are three. There is no detail in the budget documents released to date explaining why this is the case. Briefers at DOD’s budget press conference sidestepped questions. The Army deferred to the Office of the Secretary of Defense. The Office of the Secretary of Defense deferred to the briefer for the Office of Management and Budget, who was not present. One can surmise that there are three separate budget lines because the purposes are different, and congressional reactions are likely to be different. Hurricane remediation will probably gather broad support since the need is real and nonpolitical. The backfill account would fund construction projects that the Congress previously approved and that are, presumedly, still service priorities. Although many members will likely complain about funding these projects “twice,” DOD will argue that it needs the projects and that failure to backfill will only hurt military operations while having no effect on wall construction. The backfill proposal therefore has a fair chance of being approved. The $3.6B for wall construction will face stiff congressional opposition because that activity is so controversial. What is unclear is why this money is in the Department of Defense at all, since the FY 2020 budget also requests $5 billion in the Department of Homeland Security budget for wall construction. Q4: Why is the money in an Army account if it is going to fund projects in all the services? A4: Because the administration proposes a transfer fund, the money could be sent anywhere in DOD, including to other services. Putting it in one place now simplifies budgeting but also indicates the uncertainty about future use. Q5: What does the “emergency” designation mean? A5: The emergency designation means that the funds will not be restricted by the Budget Control Act caps, just like the war funding, called Overseas Contingency Operations (OCO). Thus, DOD does not need to displace core warfighting activities to fund these activities. The account is likely separate from the OCO because it is for a different purpose. The caps play an important role in the administration’s FY 2020 budget because both defense and domestic spending are requested at the budget caps (sometimes known as “sequestration levels”). DOD’s total resources are protected because there is a large increase in OCO (from $69 billion in FY 2019 to $163 billion in FY 2020), but domestic agencies are not protected and thus would be cut deeply. Cutting domestic funding deeply while increasing defense sets up a confrontation with the Congress that the administration has lost the last two years but apparently intends to attempt again. Q6: What is the role of Congress? A6: These accounts are budgeted and approved in the same way as accounts in the base budget, so Congress will have an opportunity to debate and vote on them. Q7: What about the counterdrug funds being diverted to fund the wall? A7: The Trump announcement included $2.4 billion in FY 2019 to come from counterdrug funds. DOD has an appropriation “Drug Interdiction and Counterdrug Activities, Defense,” which it uses for two types of activities. The first is detecting and interdicting drug trafficking into the United States, and the second is sharing information on illegal drugs with U.S. and foreign government agencies. The administration proposes to use this authority (10 USC 284) for construction of a border wall and, indeed, section 284(b)7 does provide for the construction of “roads and fences and installation of lighting to block drug smuggling corridors across international boundaries of the United States”. The counterdrug appropriation was established in 1989, so it has been around for a long time. Every year, the Congress typically appropriates about $900 million, usually having added some funds to the DOD request because of the state connection. This fund supports many long-standing programs. About one-third of the counterdrug funds go to the politically powerful National Guard for state programs, for example, school education. Unlike military construction projects whose impact would be felt long-term, the impact of these cuts would be felt almost immediately. This account does not contain $2.4 billion of unspent funds but probably something closer to half of the annual appropriation, or about $450 million. The administration plans to move other funds into this account to use the account’s authority for building barriers. Such large movements of funds from one account to another are conducted through “reprogramming actions”, which have customarily sought approval from the authorization and appropriation committees. However, this approval is not required by law, and the administration will apparently do the reprogrammings without congressional approval. This would be a venue for additional conflicts between the administration and the Congress, and likely provoke legislation that restricts the president’s ability to do this in the future. So far, the administration has not taken any steps to use counterdrug funds for border construction, and there is no money in the FY 2020 budget to backfill FY 2019 funds that are diverted. Q8: Are there other DOD costs for the administration’s border security program? A8: Yes, there are costs in FY 2019 for troop deployments to the border. DOD has deployed 2,300 National Guard troops and is building up to about 4,350 active-duty troops as a result of earlier administration actions to enhance border security. The cost of this deployment was about $230 million through the end of January, according to figures provided by DOD. CSIS calculates that future costs will be about $52 million a month for the active duty troops and $26 million a month for the National Guard. Thus, total costs for FY 2019 will approach $850 million, which must be paid out of existing DOD funds. There were no funds in FY 2019 specifically designated for this purpose. An Army spokesman stated that there was no money in the FY 2020 budget to continue these deployments into FY 2020. However, there has been no announcements from the White House or the Pentagon stating when deployments will end. Q9: Do these deployments have a readiness cost? A9: There is a debate about whether the deployments have a readiness cost. In the short-term, the answer is probably not. The Posse Comitatus Act prevents active-duty troops from conducting law enforcement activities, so they are limited to providing support functions like transportation, communications, intelligence, and minor construction like building barbed wire barriers. National Guard troops acting in a state role are not subject to Posse Comitatus, but, by policy, their role is also limited. DOD mostly sent units designed to perform these functions. This means that many units on the border are doing functions similar to their wartime mission. There is training value when these support units deploy from home base and perform these functions in an operational environment. At some point, however, these units need to do other training that can only be done on a military base, for example, weapons firing. Q10: Are border security and wall construction legitimate military missions? A10: There are two separate questions here: are the missions legal and are they wise? The answer to the first is almost certainly yes, military missions like these are legal. DOD has provided humanitarian relief in foreign countries, medical support to fight Ebola, and rescued American citizens trapped in hurricanes, among many other non-warfighting missions. If these are legitimate, it is hard to argue the protection of the border is illegitimate. Further, troops have been sent to the southwest border for over 20 years, mostly for counterdrug missions but also to stop migrants, so there is a long precedent. Wall construction using DOD funds appears to be allowed under various authorities (10 USC 2808 and 10 USC 284), although these are being contested in the courts. Whether these are wise uses of DOD resources is a different question. Regardless of opinions on the short-term—opinions are sharply divided and go beyond the scope of this paper— in the long-term these border security missions properly belong in the Department of Homeland Security (DHS). DHS has statutory responsibility for the wider mission and agencies specifically designed for executing it. In the future, border security should be fully funded there. In the FY 2020 budget, the administration has, indeed, requested more resources for DHS in this area, including wall construction, additional law enforcement officers, more personnel for judicial processing, and more detention facilities. Mark Cancian (Colonel, USMCR, ret.) is a senior adviser with the International Security Program at the Center for Strategic and International Studies in Washington, D.C.
### The Center for Strategic and International Studies (CSIS) is a bipartisan, nonprofit organization founded in 1962 and headquartered in Washington, D.C. It seeks to advance global security and prosperity by providing strategic insights and policy solutions to decisionmakers. On February 27 and 28, U.S. President Donald Trump met with North Korean leader Kim Jong-un for a second bilateral summit in Hanoi, Vietnam. The summit was cut short abruptly in the middle of the second day, and a widely anticipated joint statement was not signed by the two leaders. This Hanoi summit had been preceded by a historic, first-ever U.S.-North Korea summit in Singapore in June 2018. At their first meeting, Trump and Kim signed a joint statement that called for: transformed bilateral relations, building of an eventual peace regime, complete denuclearization of the Koreans peninsula, and recovery of U.S. soldier remains from the North. In addition to the statement, President Trump also announced at that time that annually held U.S.-South Korean military exercises would be suspended for fall 2018. North Korea subsequently returned 55 sets of U.S. soldier remains as a deliverable after the summit. Both sides failed, however, in the eight months following Singapore to make progress on the summit declaration due to disagreements over the definition of denuclearization and the sequencing of the steps that would be taken to fulfill the promises made in the joint statement. After a new date was set for the Hanoi summit in January, there were some hopes that these differences could be bridged in another high-level meeting between Trump and Kim. But the same issues ultimately appeared to play a role in the breakdown of the presidential-level talks in Hanoi. It appears the two leaders fundamentally misjudged each other. Kim may have calculated that Trump, eager for a foreign policy victory, would reward him with maximal sanctions relief in exchange for a continued moratorium on nuclear and missile testing, limits on existing nuclear stockpiles and a possible Yongbyon shutdown. Trump, thinking Kim was brought to the negotiating table because of his maximum pressure policy and “fire and fury” rhetoric—rather than the North’s own advances in its nuclear and missile program—thought he could entice Kim with Vietnam-style economic development. Neither expectation was borne out in Hanoi. Q1: Was this summit a failure? A1: Yes, likely on several different levels. With prior high expectations for a joint deal in Hanoi, the abrupt end to the summit could understandably be considered a waste of time, energy, and resources. It could also make it very difficult to move negotiations forward at the working level since the discussions on even basic principles have failed at the highest leadership level. Additionally, President Trump, facing more pressing domestic difficulties at home, could have his attention drawn away from North Korea, making it harder to make future progress. The question now is whether working-level negotiations can produce an agreement between the two sides on what denuclearization means in concrete terms. If there is greater institutionalization of working-level talks on denuclearization and the development of a peace track between the two countries, this could be an unintended positive outcome from the summit, despite the decision to walk away now. But, coming up with a timeline and roadmap to advance the Singapore summit declaration in the face of this decisionmaking impasse at the highest level will be a substantial challenge. Q2: Are we safer as a result of the Hanoi summit? A2: No, the threat from North Korea remains the same. While we are certainly in a much better place than in 2017—political and military tensions on the peninsula have been reduced while diplomatic engagement has continued between the United States and North Korea—we should expect that North Korea will continue to maintain and develop its nuclear weapons programs. CSIS Beyond Parallel reports show, in fact, that North Korea still maintains operational ballistic missile bases across the country and other nuclear weapons-related sites have been kept in good condition in a wait-and-see mode during negotiations. Until the United States succeeds in getting International Atomic Energy Agency (IAEA) inspectors into North Korea to oversee the suspension of nuclear operations, the sealing of buildings, and the installation of monitoring cameras, the threats posed by North Korean weapons of mass destruction programs will continue to exist. The negotiations process has taken us further off the crisis path but has not yet necessarily made us safer. We should not allow alliance equities (such as the U.S.-South Korean military exercises) to be held hostage by the negotiations. And we should not accept a de facto freeze-for-freeze situation, where North Korea freezes its nuclear and ballistic missile testing in exchange for our suspension of legitimate and necessary military exercises. To do so would set a dangerous precedent that would put us in a more untenable negotiating position later. This could also result in a diminished U.S. security posture in Asia and potential problems with alliance relationships in the future. Q3: Where do we go from here? A3: It’s not clear. Unfortunately, the failure of negotiations at the top does not leave much room for diplomatic maneuvering going forward. The South Koreans will be anxious to pick up the pieces after this summit and play a moderator role in resuming productive negotiations. South Korean president Moon Jae-in could try another summit between the two Koreas to attempt to bridge differences between all involved parties. In South Korea, President Moon will be in a very difficult spot politically if this entire process breaks down, so he will be anxious to find ways to break the impasse. The North Koreans will huddle with the Chinese and Russians to try to make sense of what happened at Hanoi, and they may regroup to come up with another negotiating strategy. The most important thing to watch will be how the summit is portrayed in North Korean state media and whether or not the North Koreans will blame the United States for the failure in diplomacy and return to brinkmanship tactics. From the U.S. perspective, we will need to decide how to respond to a continuing stalemate. This summer, for example, the United States will need to decide whether to allow a major military exercise with South Korea to go forward. If the military exercises get the green light, Kim could decide to respond in some fashion, such as a missile test. In this case, China would not respond harshly because Kim’s provocation would be seen as a response to U.S. action. North Korea is the land of lousy options. So far President Trump has been no more successful than his predecessors in solving this strategic riddle—but at least we are in a better position now than in 2017 when talk of preemptive war was in the air. Sue Mi Terry is a senior fellow with the Korea Chair at the Center for Strategic and International Studies (CSIS) in Washington, D.C. Lisa Collins is a fellow with the CSIS Korea Chair. © 2019 by the Center for Strategic and International Studies. All rights reserved. ### The Center for Strategic and International Studies (CSIS) is a bipartisan, nonprofit organization founded in 1962 and headquartered in Washington, D.C. It seeks to advance global security and prosperity by providing strategic insights and policy solutions to decisionmakers. Washington, DC 20036 Click here to edit your subscription preferences or Click here to stop receiving all emails from CSIS. Next week, President Trump and Kim Jong-un will hold their second meeting in the past year. Speculation is building that the two leaders will announce a peace declaration at their meeting, supposedly ending the state of war that has existed on the Korean peninsula since Kim Jong-un’s grandfather invaded South Korea in 1951. For the millions of South Koreans in Seoul who live in the shadow of North Korea’s artillery—much less the millions more in Korea, Japan, and the United States who live within range of Kim Jong-un’s nuclear, chemical, and biological weapons and intercontinental ballistic missiles—such a declaration should be a great accomplishment and a relief. Should be. Unfortunately, it is not likely to be. The dilemma in the current rush to talks is not whether peace on the Korean peninsula should be pursued: it should. The dilemma is that little work has been done in either South Korea or the United States to consider what benefits would result from a peace declaration—rather than a peace treaty—and what risks such a declaration would introduce. A peace declaration—however positively it might be viewed—is not a guarantee of peace. Peace is when the parties to a conflict agree to end hostilities, pull back their militaries, and forgo their efforts to subdue the other by force. If there is a peace declaration in Hanoi, it is far more likely to embolden Kim and others like him. He will assess—probably rightly—that his pursuit of nuclear weapons and intercontinental missile delivery systems won him the respect or fear of his primary adversary. Sufficiently so that he was able to achieve what neither his father or grandfather could: not one, but two meetings with the U.S. president and, possibly, a peace declaration. For 70 years, the United States and South Korea have worked together to ensure that South Koreans are free, prosperous, and safe. This has not always gone smoothly, and the United States has made its share of mistakes. The trajectory of the relationship, and certainly the trajectory of South Korea, has been upward for the past three generations. South Koreans persevered to build a wealthy, highly educated country that is a marvel of the world. The United States can be proud of having partnered with South Korea on that journey so far. A peace declaration could create the appearance of safety within South Korea while increasing the risk of long-term problems. There are three primary elements to this. First, a peace declaration would give Kim Jong-un leverage to push President Trump in a direction he is already inclined to move: to withdraw U.S. troops from the Korean peninsula. Despite South Korea’s recent agreement to increase its financial support for U.S. military forces in Korea, President Trump may still view (wrongly) that withdrawing U.S. troops as a way to save money. Second, in seeking a peace declaration, Kim will most likely focus on reducing the combined U.S.-South Korea conventional military presence at the de-militarized zone (DMZ). He may even be willing to withdraw some North Korean conventional forces from the DMZ. The catch is that in pulling back conventional military units from the DMZ that has divided the Korean peninsula since 1953, Kim will surrender depreciating military assets. The potency of his conventional forces has likely long since eroded. Instead, Kim will push for seemingly even-handed reductions in conventional forces between the South and the North. The result of such agreements would be the North gaining advantage through the U.S.-South Korea alliance making additional concessions beyond last year’s suspension of exercises, possibly ceding positions that provide it advantages relative to North Korea’s declining conventional forces. Despite President Trump’s misgivings about alliances and overseas basing of U.S. troops, public polling shows strong support for the U.S.-South Korea alliance in both countries. Congress reaffirmed this position in law last year, ensuring continued U.S. commitment of troops to Korea in support of the alliance. Until North Korea relinquishes its weapons of mass destructions, and until China determines it will be more successful with partners rather than clients, the United States will be best served by maintaining its commitment to South Korea. Through 70 years, the United States concept of partnership has evolved, but it has had a consistent core: the United States is more prosperous when our trading partners are more prosperous; the United States is more secure when our allies are more secure. A peace declaration without a real path to peace makes neither South Korea or the United States more prosperous or more secure. Until it does, it is a bad deal. John Schaus is a fellow with the International Security Program at the Center for Strategic and International Studies, in Washington, D.C.
Add us to your address book Click here to edit your subscription preferences or Click here to stop receiving all emails from CSIS. Alan Garwood, BAE Systems Group Business Development Director – Job Very Well Done! By Howard Wheeldon, FRAeS, Wheeldon Strategic Advisory Ltd.
19 Oct 18. The US Defense Majors’ Reporting Season kicked off with strong showing across the board spurred by strong growth in civil aerospace markets. The wall of money in the US defense segment is due to hit the markets next year. A source told BATTLESPACE at AUSA that 6 companies are the recipients of 40% of the budget. 24 Oct 18. The Boeing Company [NYSE: BA] reported third-quarter revenue of $25.1 bn driven by higher defense volume and services growth (Table 1). GAAP earnings per share increased to $4.07 and core earnings per share (non-GAAP)* increased to $3.58 primarily driven by strong operating performance at Commercial Airplanes and a tax benefit related to a tax settlement ($0.71 per share). Results also reflect charges related to planned investments in the newly awarded T-X Trainer and MQ-25 programs ($0.93 per share). Boeing delivered strong operating cash flow of $4.6bn, repurchased $2.5 bn of shares, and paid $1.0bn of dividends. The company’s revenue guidance increased $1.0bn to between $98.0 and $100.0bn, driven by defense volume and services growth, inclusive of the KLX acquisition. Operating cash flow guidance is reaffirmed at $15.0 to $15.5bn. Full year GAAP earnings per share guidance is increased to between $16.90 and $17.10 from between $16.40 and $16.60 and core earnings per share (non-GAAP)* guidance is increased to between $14.90 and $15.10 from between $14.30 and $14.50 driven by a lower-than-expected tax rate and improved performance at Commercial Airplanes. Operating cash flow in the quarter increased to $4.6bn, primarily driven by timing of receipts and expenditures as well as planned higher commercial airplane production rates and strong operating performance. During the quarter, the company repurchased 7.0 m shares for $2.5bn, leaving $9.6bn remaining under the current repurchase authorization which is expected to be completed over approximately the next 12 to 18 months. The company also paid $1.0bn in dividends in the quarter, reflecting a 20 percent increase in dividends per share compared to the same period of the prior year. Cash and investments in marketable securities totaled $10.0bn, compared to $9.8bn at the beginning of the quarter. Debt was relatively stable at $11.9bn. Total company backlog at quarter-end was $491bn, up from $488bn at the beginning of the quarter, and included net orders for the quarter of $28bn. Commercial Airplanes third-quarter revenue of $15.3bn was relatively unchanged, reflecting lower deliveries largely offset by mix . Third-quarter operating margin increased to 13.2 percent, reflecting higher 787 margin and strong operating performance on production programs, partially offset by $112m of cost growth on the KC-46 Tanker program due to higher than expected effort to meet customer requirements to support delivery of the initial aircraft, as well as due to incremental delays in certification and testing. During the quarter, Commercial Airplanes delivered 190 airplanes, including 57 737 MAX airplanes. The 777X program remains on track for delivery in 2020 as the static test airplane was completed and moved into test setup and the first two flight test airplanes were in production. Commercial Airplanes booked 171 net orders during the quarter, valued at $13 bn. The 787 program has captured more than 100 orders in 2018 and nearly 1,400 orders since its launch. Backlog remains robust with more than 5,800 airplanes valued at $413 bn. Commercial Airplanes revenue guidance is reaffirmed at between $59.5 and $60.5 bn and margin guidance is increased to between 12% and 12.5% from greater than 11.5% on strong performance. Defense, Space & Security third-quarter revenue increased to $5.7bn driven by increased volume across government satellites, KC-46 Tanker, F/A-18 and weapons (Table 5). Third-quarter operating margin was (4.3) percent, primarily reflecting $691m of charges related to planned investments in the T-X and MQ-25 programs and $64m related to cost growth on the KC-46 Tanker program. During the quarter, Defense, Space & Security won key franchise program awards, including the T-X Trainer and MH-139 helicopter for the U.S. Air Force, the MQ-25 unmanned aircraft for the U.S. Navy, and the fourth KC-46 Tanker production lot. Significant milestones during the quarter included first flights of the Apache and Chinook for the Indian Air Force and receipt of Supplemental Type Certification for the KC-46 Tanker program, signifying completion of FAA certification. We also completed the acquisition of Millennium Space Systems, which will provide customers with advanced small-satellite technologies and flexible solutions. Backlog at Defense, Space & Security was $58bn, of which 31 percent represents orders from customers outside the U.S. Defense, Space & Security revenue guidance increased to between $22.5 and $23.0bn from between $22.0 and $23.0bn driven by higher volume and margin guidance is adjusted to greater than 6.5% from between 10% and 10.5% primarily to account for the investments in the business. Global Services third-quarter revenue increased to $4.1bn, primarily driven by higher parts volume (Table 6). Third-quarter operating margin was 13.3 percent reflecting mix and higher period costs. During the quarter, Global Services was awarded P-8 training contracts for the U.S. Navy and Royal Australian Air Force, captured an order from GECAS for 20 737-800 converted freighters, and completed the first P-8A heavy maintenance check for the U.S. Navy. Global Services also secured contracts for F/A-18 spares for the Defense Logistics Agency and KC-46 Tanker services for Lots 3 and 4. In early October, Global Services completed the acquisition of KLX, which will enhance our services business and allow us to deliver greater value to customers. Global Services revenue guidance increased to between $16.0 and $16.5bn from between $15.5 and $16.0bn driven by higher volume and margin guidance is reaffirmed at approximately 15.5%. At quarter-end, Boeing Capital’s net portfolio balance was $3.1 bn. Revenue in other unallocated items and eliminations decreased primarily due to the 2017 sale of aircraft previously leased to customers. The change in earnings from other unallocated items and eliminations is primarily due to timing of expense allocations. The effective tax rate for the third quarter decreased from the same period in the prior year primarily due to a $412 m benefit related to a 2013-2014 tax settlement and the reduction of the federal tax rate to 21%. 24 Oct 18. General Dynamics (NYSE: GD) today reported third-quarter 2018 earnings from continuing operations of $864m, a 13.1 percent increase over third-quarter 2017. Revenue increased 20 percent to $9.1bn. While a large portion of the growth was attributed to the acquisition of CSRA, revenue in all segments grew. Diluted earnings per share (EPS) from continuing operations were $2.89 compared to $2.52 in the year-ago quarter, a 14.7 percent increase. Significant activities this quarter included the delivery of the Virginia-class submarine SSN 790 (future USS South Dakota), the keel-laying of the first John Lewis-class fleet replenishment oiler and the continued integration of CSRA. Company-wide operating margin for the third quarter of 2018 was 12.5 percent, a 70 basis-point increase over second-quarter 2018. Net cash provided by operating activities in the quarter totaled $790m, compared to $872m in the year-ago quarter. Free cash flow from operations, defined as net cash provided by operating activities less capital expenditures, was $622m, after a $255 m discretionary pension plan contribution. The company repurchased 450,000 of its outstanding shares in the third quarter of 2018. Year-to-date, the company has repurchased 2.5m outstanding shares. The company’s total backlog at the end of third-quarter 2018 was $69.5bn, up 4.9 percent from second-quarter 2018. The estimated potential contract value, representing management’s estimate of value in unfunded indefinite delivery, indefinite quantity (IDIQ) contracts and unexercised options, was $34.7bn. Total potential contract value, the sum of all backlog components, was $104.2bn at the end of the quarter, a new record. Order activity was robust across the company with a 1.4-to-1 total book-to-bill ratio, defined as orders divided by revenue. Significant awards in the quarter included $3.9bn from the U.S. Navy for the construction of four Arleigh Burke-class (DDG-51) guided-missile destroyers; $580 from the Navy for surface ship maintenance and modernization work; $480 from the Navy to continue design and development work for the Columbia-class submarine program; $210 from the Centers for Medicare & Medicaid Services for benefits recovery services, cloud hosting and IT support; $170 from the Navy for combat and seaframe control systems for Littoral Combat Ships; and $150 from the U.S. Army for equipment to support the Army’s mobile communications network. In addition, the Army awarded a $3.9bn maximum-potential-value IDIQ contract for computing and communications equipment under the Common Hardware Systems-5 (CHS-5) program. “Honeywell continued to build on its strong first-half performance, delivering exceptional results across the board. Organic sales were up 7 percent driven by continued double-digit growth in our warehouse automation business; strong growth across the Aerospace business; demand for Solstice® low global-warming materials and short-cycle Process Solutions software and services; and continued momentum in Homes and ADI global distribution. The increased volumes, coupled with our operational excellence initiatives, drove 70 basis points of segment margin expansion, which is 20 basis points above the high end of our guidance. This resulted in adjusted earnings per share of $2.03, up 17 percent year-over-year,” said Darius Adamczyk, Chairman and Chief Executive Officer of Honeywell. “In the third quarter, we generated more than $1.8bn of adjusted free cash flow, up 51 percent year-over-year, with conversion of 119 percent. We also repurchased approximately $600 m in Honeywell shares in the third quarter and increased our dividend by 10 percent – the ninth double-digit increase since 2010. Through the third quarter of 2018, we have committed more than $4.5bn in capital deployment through share repurchases, dividends and acquisitions. This has been an exciting year for Honeywell. The portfolio changes we announced at this time last year are nearly complete, and we recently announced the acquisition of Transnorm, a leading provider of warehouse automation solutions with a large and growing installed base and an attractive aftermarket. We are well positioned to deliver strong results in 2019 and are committed to delivering outstanding returns for our shareowners over the long term,” Adamczyk concluded. The company revised its full-year guidance to reflect the strong operational performance in the first three quarters of 2018, the completion of the spin-off of Garrett Motion Inc. (NYSE: GTX), which separated from Honeywell on October 1, and the expected completion of the spin-off of Resideo Technologies, Inc. on October 29. Sales are now expected to be $41.7bn to $41.8bn; organic sales growth is now expected to be approximately 6 percent; segment margin expansion is now expected to be 50 to 60 basis points; and adjusted earnings per share4 is now expected to be $7.95 to $8.00. The new guidance range takes into account $0.27 of net earnings dilution from the separation of the Garrett and Resideo businesses, partially offset by a $0.07 increase to reflect the company’s improved fourth-quarter outlook. Honeywell sales for the third quarter were up 6 percent on a reported basis and up 7 percent on an organic basis. The difference between reported and organic sales primarily relates to the impact of foreign currency translation. Third-quarter reported earnings per share was $3.11, which includes $233 m of separation costs (including net tax impacts) associated with the Garrett and Resideo spin-offs and a $1bn favorable adjustment to the charge the company took in the fourth quarter of 2017 related to U.S. tax legislation. 23 Oct 18. Lockheed Martin (NYSE: LMT) today reported third quarter 2018 net sales of $14.3 bn, compared to $12.3 bn in the third quarter of 2017. Net earnings in the third quarter of 2018 were $1.5bn, or $5.14 per share, compared to $963m, or $3.32 per share, in the third quarter of 2017. Cash from operations in the third quarter of 2018 was $361m after pension contributions of $1.5bn, compared to cash from operations of $1.8bn in the third quarter of 2017, with no pension contributions. The corporation expects its 2019 net sales to increase by approximately 5.0 percent to 6.0 percent as compared to the 2018 outlook. Total business segment operating margin in 2019 is expected to be in the 10.5 percent to 10.8 percent range and cash from operations is expected to be greater than or equal to $7.0 bn. The preliminary outlook for 2019 assumes the U.S. Government continues to support and fund the corporation’s key programs. Changes in circumstances may require the corporation to revise its assumptions, which could materially change its current estimate of 2019 net sales, operating margin and cash flows. The corporation expects the net 2019 FAS/CAS pension benefit to be approximately $1.5bn assuming a 4.125 percent discount rate (a 50 basis point increase from the end of 2017), a 1.00 percent return on plan assets in 2018, and a 7.00 percent expected long-term rate of return on plan assets in future years (a 50 basis point decrease from the end of 2017), among other assumptions. As a result of the $5.0bn in contributions to its qualified defined benefit pension plans in 2018 the corporation does not expect to make contributions to its qualified defined benefit pension plans in 2019. A change of plus or minus 25 basis points to the assumed discount rate, with all other assumptions held constant, would result in an incremental increase or decrease of approximately $120m to the estimated net 2019 FAS/CAS pension adjustment. A change of plus or minus 100 basis points to the return on plan assets in 2018 only, with all other assumptions held constant, would increase or decrease the net 2019 FAS/CAS pension adjustment by approximately $20m. The corporation will finalize the postretirement benefit plan assumptions and determine the 2018 actual return on plan assets on Dec. 31, 2018. The final assumptions and actual investment return for 2018 may differ materially from those discussed above. receiving net proceeds of $490m for issuance of commercial paper, compared to no net proceeds in the third quarter of 2017. As previously reported on Sept. 27, 2018, the corporation increased its quarterly dividend by $0.20 per share, to $2.20 per share, beginning with the dividend payment in the fourth quarter of 2018. The corporation also increased its share repurchase authority by $1.0bn with $3.7bn in total remaining authorization for future common share repurchases under the program as of Sept. 30, 2018. The corporation operates in four business segments organized based on the nature of products and services offered: Aeronautics, Missiles and Fire Control (MFC), RMS and Space. During the third quarter of 2018 the corporation realigned certain programs among the lines of business at MFC. The amounts discussed and presented for the MFC lines of business results reflect this realignment for all periods presented. The following table presents summary operating results of the corporation’s business segments and reconciles these amounts to the corporation’s consolidated financial results. Net sales of the business segments exclude intersegment sales as these activities are eliminated in consolidation. Operating profit of the business segments includes the corporation’s share of earnings or losses from equity method investees as the operating activities of the equity method investees are closely aligned with the operations of the corporation’s business segments. In addition, operating profit of the corporation’s business segments includes total pension costs recoverable on U.S. Government contracts as determined in accordance with CAS. Operating profit of the business segments excludes the FAS/CAS operating adjustment, which represents the difference between the service cost component of pension expense recorded in accordance with FAS and CAS pension cost; the adjustment from CAS to the FAS service cost component for all other postretirement benefit plans; expense for stock-based compensation; the effects of items not considered part of management’s evaluation of segment operating performance, such as charges related to significant severance actions and certain asset impairments; gains or losses from significant divestitures; the effects of certain legal settlements; corporate costs not allocated to the corporation’s business segments; and other miscellaneous corporate activities. Changes in net sales and operating profit generally are expressed in terms of volume. Changes in volume refer to increases or decreases in sales or operating profit resulting from varying production activity or service levels on individual contracts. Volume changes in segment operating profit are typically based on the current profit booking rate for a particular contract. In addition, comparability of the corporation’s segment sales, operating profit and operating margin may be impacted favorably or unfavorably by changes in profit booking rates on the corporation’s contracts for which it recognizes revenue over a period of time using the percentage-of-completion cost-to-cost method to measure progress towards completion. Increases in the profit booking rates, typically referred to as risk retirements, usually relate to revisions in the estimated total costs to fulfill the performance obligations that reflect improved conditions on a particular contract. Conversely, conditions on a particular contract may deteriorate, resulting in an increase in the estimated total costs to fulfill the performance obligations and a reduction in the profit booking rate. Increases or decreases in profit booking rates are recognized in the current period and reflect the inception-to-date effect of such changes. Segment operating profit and margin may also be impacted favorably or unfavorably by other items, which may or may not impact sales. Favorable items may include the positive resolution of contractual matters, cost recoveries on severance and restructuring charges, insurance recoveries and gains on sales of assets. Unfavorable items may include the adverse resolution of contractual matters; restructuring charges, except for significant severance actions which are excluded from segment operating results; reserves for disputes; certain asset impairments; and losses on sales of certain assets. The corporation’s consolidated net adjustments not related to volume, including net profit booking rate adjustments, represented approximately 34 percent of total segment operating profit in the third quarter of 2018, compared to approximately 28 percent in the third quarter of 2017. Aeronautics’ net sales in the third quarter of 2018 increased $926m, or 20 percent, compared to the same period in 2017. The increase was primarily attributable to an increase of approximately $655 m for the F-35 program due to increased volume on production and sustainment, partially offset by lower volume on development activities; about $105m for other programs due to higher volume (primarily advanced development programs (ADP)); about $70m for the F-16 program due to increased volume on modernization contracts; and about $50m for the F-22 program due to increased sustainment volume. Aeronautics’ operating profit in the third quarter of 2018 increased $87m, or 17 percent, compared to the same period in 2017. Operating profit increased approximately $155m for the F-35 program primarily due to increased volume on higher margin production contracts and new development activities, better performance on sustainment, and higher risk retirements on production contracts. This increase was partially offset by a decrease of about $50m for the F-16 program due to lower risk retirements. Adjustments not related to volume, including net profit booking rate adjustments, were about $10m lower in the third quarter of 2018 compared to the same period in 2017. MFC’s net sales in the third quarter of 2018 increased $316m, or 16 percent, compared to the same period in 2017. The increase was primarily attributable to higher net sales of approximately $295 m for tactical and strike missiles programs due to increased volume (primarily classified programs and precision fires) and about $115 m for sensors and global sustainment programs due to increased volume (primarily LANTIRN®, SNIPER®, and Apache). These increases were partially offset by a decrease of approximately $75 m for integrated air and missile defense programs due to lower volume (primarily Terminal High Altitude Area Defense (THAAD)). MFC’s operating profit in the third quarter of 2018 increased $34m, or 11 percent, compared to the same period in 2017. Operating profit increased approximately $55m for sensors and global sustainment programs due to increased risk retirements and increased volume (primarily LANTIRN, SNIPER, and Apache); and about $45m for tactical and strike missiles programs due to reserves which were recorded in 2017 but did not recur in 2018 (primarily Joint Air-to-Ground Missile (JAGM)) and higher volume (primarily precision fires). These increases were partially offset by a decrease of approximately $50m for integrated air and missile defense programs due to lower volume and lower risk retirements (primarily THAAD). Adjustments not related to volume, including net profit booking rate adjustments, were about $90m higher in the third quarter of 2018 to the same period in 2017. RMS’ net sales in the third quarter of 2018 increased $485m, or 14 percent, compared to the same period in 2017. The increase was primarily attributable to higher net sales of approximately $250 m for integrated warfare systems and sensors (IWSS) programs due to higher volume (primarily radar surveillance systems programs and Multi Mission Surface Combatant); about $115m for C6ISR (command, control, communications, computers, cyber, combat systems, intelligence, surveillance, and reconnaissance) programs due to higher volume on multiple programs; and about $100m for Sikorsky helicopter programs due to higher volume for CH-53K King Stallion helicopters and higher volume for mission systems programs, partially offset by lower volume for Black Hawk helicopters. RMS’ operating profit in the third quarter of 2018 increased $104m, or 40 percent, compared to the same period in 2017. Operating profit increased approximately $85m for IWSS programs primarily due to a reduction in charges for performance matters (primarily vertical launching system (VLS)) and due to increased risk retirements (primarily radar surveillance systems programs); and about $20m for Sikorsky helicopter programs due to better cost performance across the Sikorsky portfolio and better performance on the Multi-Year IX contract. Adjustments not related to volume, including net profit booking rate adjustments, were about $50 m higher in the third quarter of 2018 compared to the same period in 2017. Space’s net sales in the third quarter of 2018 increased $250m, or 11 percent, compared to the same period in 2017. The increase was primarily attributable to higher net sales of approximately $120m for government satellite programs due to higher volume (primarily Space Based Infrared System (SBIRS) and government satellite services); about $85 m for strategic and missile defense programs due to higher volume (primarily Fleet Ballistic Missiles and AWE Management Limited (AWE)); and about $50 m for the Orion program due to higher volume. Space’s operating profit in the third quarter of 2018 increased $74 m, or 34 percent, compared to the same period in 2017. Operating profit increased approximately $80m for government satellite programs due to a reduction in charges and higher volume (primarily SBIRS and government satellite services). Adjustments not related to volume, including net profit booking rate adjustments, were about $50m higher in the third quarter of 2018, compared to the same period in 2017. Total equity earnings recognized by Space (primarily ULA) represented approximately $45m, or 15 percent, of Space’s operating profit in the third quarter of 2018, compared to approximately $45m, or 21 percent, in the third quarter of 2017. The corporation’s effective income tax rate was 6.5 percent in the third quarter of 2018, compared to 25.8 percent in the third quarter of 2017. The lower rate for the third quarter of 2018 was primarily due to the reduction of the federal statutory rate from 35 percent to 21 percent and the deduction for foreign derived intangible income, both as a result of the Tax Cuts and Jobs Act (the Tax Act) enacted in Dec. 2017. The rates for both periods benefited from tax deductions for dividends paid to the corporation’s defined contribution plans with an employee stock ownership plan feature, tax deductions for employee equity awards, and the research and development tax credit. The rate for the third quarter of 2018 benefited from the corporation’s change in a tax accounting method recorded discretely in this quarter, reflecting a 2012 Court of Federal Claims decision, which held that the tax basis in certain assets should be increased and realized upon the assets’ disposition. The rate for the third quarter of 2017 benefited from tax deductions for U.S. manufacturing activities, which the Tax Act repealed for years after 2017. 24 Oct 18. Northrop Grumman Corporation (NYSE: NOC) reported third quarter 2018 sales increased 23 percent to $8.1bn. Third quarter 2018 net earnings increased 78 percent to $1.1bn, or $6.54 per diluted share, compared with $643m, or $3.67 per diluted share, in the prior year period. The third quarter includes the first full quarter of Innovation Systems results. These additional earnings were partially offset by pre-tax merger-related expenses of $97m. Third quarter 2018 earnings also include a pre-tax benefit of $223m resulting from the settlement of cost claims. “Our third quarter results demonstrated solid growth and strong performance from our operations, including the first full quarter of Innovation Systems, as we continue to position the company for longterm profitable growth,” said Wes Bush, chairman and chief executive officer. “We’re pleased with this quarter’s results and excited about our company’s future. As we continue integrating Innovation Systems, we’re aggressively addressing the enhanced opportunity set resulting from our combination,” said Kathy Warden, president and chief operating officer. Pension Cost and Net Periodic Postretirement Benefit Cost, using the full retrospective method. Schedules 4 and 5 at the end of this release present comparable prior period consolidated and segment financial information recast to reflect the adoption of these standards. Third quarter 2018 sales increased 23 percent, due to the acquisition of Innovation Systems and higher sales at Aerospace Systems and Mission Systems, partially offset by lower sales at Technology Services. Third quarter segment operating income increased $223m, and segment operating margin rate increased to 12.1 percent, reflecting the first full quarter of Innovation Systems and performance improvement at Mission Systems and Aerospace Systems. Third quarter 2018 operating income and margin rate increased to $1.2bn and 14.6 percent, respectively, due to the 29 percent increase in segment operating income and a $112m decline in unallocated corporate expense. Lower unallocated corporate expense principally reflects the settlement of cost claims, partially offset by $97m in expenses principally related to the Innovation Systems acquisition, as well as $32m of higher deferred state taxes and legal expenses. Third quarter interest expense increased $60m, which reflects the company’s issuance in October 2017 of $8.25bn of debt to finance the Innovation Systems acquisition. Other, net increased $41m and includes a $21m gain on the sale of an investment. The company’s third quarter federal and foreign income tax expense declined to $93m, reflecting the benefit of the Tax Cuts and Jobs Act of 2017, which reduced the federal statutory tax rate to 21 percent from 35 percent, a $3 m benefit from pension contributions related to the filing of our 2017 tax return, and a $70m benefit recognized for additional research credits and manufacturing deductions related to prior years. Third quarter 2018 cash provided by operating activities before the after-tax discretionary pension contribution increased to $975 m from $938 m in the prior year period. The company made a $250 m discretionary contribution to its pension plans in the third quarter of 2018. After capital expenditures of $282 m, third quarter 2018 free cash flow before the after-tax discretionary pension contribution was $693 m.
Year to date through Sept. 30, 2018, cash provided by operating activities before the after-tax discretionary pension contribution increased $607m to $1.6bn from $1.0 bn in the prior year. The increase is principally due to higher earnings and improved trade working capital performance. After capital expenditures of $786m, free cash flow before the after-tax discretionary pension contribution through Sept. 30, 2018 was $827m. Aerospace Systems third quarter 2018 sales increased 5 percent, principally due to higher Manned Aircraft sales. Higher volume for restricted activities and the F-35 program were the primary drivers of higher Manned Aircraft volume. Autonomous Systems also had higher sales than in the prior year period, principally due to higher volume for the Triton program. Higher sales in these areas were partially offset by lower volume in Space. Aerospace Systems third quarter 2018 operating income increased 9 percent, and operating margin rate increased to 11.5 percent. Higher operating income reflects higher sales and higher operating margin rate reflects improved performance for Manned Aircraft and Autonomous Systems programs. Innovation Systems third quarter 2018 sales increased 16 percent, compared with $1.2bn pro forma sales in the third quarter of 2017 (see Note 2 to the financial statements in our quarterly report on Form 10-Q for the quarter ended Sept. 30, 2018 for consolidated pro forma information). The sales increase was due to higher volume on Defense Systems, Flight Systems and Space Systems programs. Defense Systems sales reflect increased volume on armament systems and missile product programs. Flight Systems sales were primarily driven by higher volume on propulsion systems and launch vehicles programs. Space Systems sales increased primarily due to higher government satellite volume. Innovation Systems third quarter 2018 operating income totaled $161m and operating margin rate was 11.4 percent. Mission Systems third quarter 2018 sales increased 3 percent principally due to higher volume for Sensors and Processing programs, partially offset by lower volume for Advanced Capabilities and Cyber and ISR. Higher Sensors and Processing sales are primarily due to higher volume on restricted, electrooptical/infrared self-protection and communications programs, as well as on the F-35 program. Lower Advanced Capabilities sales reflect lower volume on the Joint National Integration Center Research and Development (JRDC) program and follow on activity, partially offset by higher volume on the Integrated Air and Missile Defense Battle Command System (IBCS) program. Lower Cyber and ISR sales reflect ramp-down on an ISR program. Mission Systems third quarter operating income increased 11 percent, and operating margin rate increased to 13.7 percent. The increase in operating income reflects higher sales volume and improved performance across all three business areas. Technology Services third quarter 2018 sales decreased 12 percent due to the completion of several programs, including JRDC, Virginia Information Technologies Agency (VITA), and KC-10. These declines were partially offset by higher volume on several other programs, principally in Global Logistics and Modernization, including the Special Electronic Mission Aircraft program. Technology Services third quarter 2018 operating income decreased 10 percent and operating margin rate increased to 10.7 percent. Lower operating income reflects lower sales volume, partially offset by improved performance. 25 Oct 18. Raytheon Company (NYSE: RTN) today announced net sales for the third quarter 2018 of $6.8bn, up 8.3 percent compared to $6.3bn in the third quarter 2017. Third quarter 2018 EPS from continuing operations was $2.25 compared to $1.97 in the third quarter 2017. The increase in the third quarter 2018 EPS from continuing operations was primarily driven by operational improvements, and lower taxes primarily associated with tax reform. This was partially offset by the previously disclosed non-operating expense associated with the pension plan annuity transaction, which had an unfavorable $0.80 per share impact. Operating cash flow from continuing operations for the third quarter 2018 was an outflow of $444m compared to an inflow of $382m for the third quarter 2017. The decrease in operating cash flow from continuing operations in the third quarter 2018 was primarily due to the previously disclosed $1.25 bn pretax discretionary pension contribution, partially offset by lower net cash taxes. In the third quarter 2018, the company repurchased 0.6 m shares of common stock for $125m. Year-to-date 2018, the company repurchased 4.5 m shares of common stock for $925m. The company had bookings of $8.7 bn in the third quarter 2018, resulting in a book-to-bill ratio of 1.28. Third quarter 2017 bookings were $7.0 bn. Backlog at the end of the third quarter 2018 was a record $41.6 bn, an increase of $4.9 bn or 13.4 percent compared to the end of the third quarter 2017. Integrated Defense Systems (IDS) had third quarter 2018 net sales of $1,493m, up 7 percent compared to $1,391 m in the third quarter 2017. The increase in net sales for the quarter was primarily driven by higher net sales from an international Patriot® program awarded in the first quarter 2018. IDS recorded $241m of operating income in the third quarter 2018 compared to $231m in the third quarter 2017. The increase in operating income for the quarter was primarily driven by a favorable change in program mix and higher volume, partially offset by lower net program efficiencies. During the quarter, IDS booked $1.3bn to provide advanced Patriot air and missile defense capabilities for Poland. IDS also booked $191m for the Forward Expeditionary Advanced Vehicle Radar (FEAVR) program for the U.S. Army and $75 m for a lightweight torpedo program for the U.S. Navy and international customers. Intelligence, Information and Services (IIS) had third quarter 2018 net sales of $1,74 m, up 13 percent compared to $1,543m in the third quarter 2017. The increase in net sales for the quarter was primarily driven by higher net sales on classified programs in both the cyber and space business areas, the Development, Operations and Maintenance (DOMino) cyber program, and the Warfighter FOCUS program. IIS recorded $149m of operating income in the third quarter 2018 compared to $112m in the third quarter 2017. The increase in operating income for the quarter was primarily driven by higher net program efficiencies and higher volume. During the quarter, IIS booked $787m on a number of classified contracts. IIS also booked $299 m on domestic and foreign training programs in support of Warfighter FOCUS activities; $108 m to provide intelligence, surveillance and reconnaissance (ISR) support to the U.S. Air Force; and $99m on the Air and Space Operations Center Weapon System (AOC WS) program for the U.S. Air Force. Missile Systems (MS) had third quarter 2018 net sales of $2,082 m, up 7 percent compared to $1,945 m in the third quarter 2017. The increase in net sales for the quarter was primarily driven by higher net sales on classified programs. MS recorded $257 m of operating income in the third quarter 2018 compared to $280 m in the third quarter 2017. The decrease in operating income for the quarter was primarily due to lower net program efficiencies, partially offset by higher volume. During the quarter, MS booked $499 m for Phalanx® Close-In Defense Systems (CIDS); $424 m for Standard Missile-6 (SM-6®); $115 m for Javelin; $113 m on the High-speed Unmanned Long-range Kinetic-kill (HULK) program; $89 m for Paveway™; $84 m for Horizontal Technology Integration (HTI) forward looking infrared kits; and $84 m for Rolling Airframe Missile (RAM™). MS also booked $155 m on a number of classified contracts. Space and Airborne Systems (SAS) had third quarter 2018 net sales of $1,695 m, up 6 percent compared to $1,597m in the third quarter 2017. The increase in net sales for the quarter was driven by higher net sales on surveillance and targeting systems programs. SAS recorded $223m of operating income in the third quarter 2018 compared to $212 m in the third quarter 2017. The increase in operating income for the quarter was primarily due to higher volume. During the quarter, SAS booked $282m on the Multi-Spectral Targeting System (MTS) for the U.S. Air Force; $136m on the Next Generation Jammer (NGJ) program for the U.S. Navy; $103m for Active Electronically Scanned Array (AESA) radars for the U.S. Air Force; and $92m for radar components for the U.S. Navy. SAS also booked $374m on a number of classified contracts. Forcepoint had third quarter 2018 net sales of $173m, up 2 percent compared to $170m in the third quarter 2017. Forcepoint recorded $18m of operating income in the third quarter 2018 compared to $23m in the third quarter 2017. As expected, the decrease in operating income for the quarter was primarily driven by higher operating costs. 22 Oct 18. United Technologies Corp. (NYSE: UTX) today reported third quarter 2018 results and increased its full year sales and adjusted EPS outlook. “Based on the continued positive momentum year-to-date, we are again raising our adjusted EPS outlook range and now expect $7.20 to $7.30 for 2018. * We are also raising the low end of our 2018 sales outlook and now expect $64.0 to $64.5bn of sales on an improved organic growth outlook of 6 percent,”* Hayes concluded. Third quarter sales of $16.5bn were up 10 percent over the prior year, including 8 points of organic sales growth, 3 points from the absence of the nonrecurring charge incurred at Pratt & Whitney in Q3 2017 and 1 point of foreign exchange headwind. GAAP EPS of $1.54 was down 8 percent versus the prior year and included 39 cents of net restructuring charges and other significant items. Adjusted EPS of $1.93 was up 12 percent. Net income in the quarter was $1.2 bn, down 7 percent versus the prior year. Cash flow from operations was $1.8bn and capital expenditures were $413 m, resulting in free cash flow of $1.3bn. In the quarter, commercial aftermarket sales were up 9 percent at Pratt & Whitney and up 12 percent at UTC Aerospace Systems. Otis new equipment orders were up 9 percent organically versus the prior year. Equipment orders at UTC Climate, Controls & Security increased 13 percent organically. There is no change in the Company’s previously provided 2018 expectations for free cash flow of $4.5to $5.0bn. *Notes: Excludes the impact of the pending acquisition of Rockwell Collins. When we provide expectations for adjusted EPS, organic sales and free cash flow on a forward-looking basis, a reconciliation of the differences between the non-GAAP expectations and the corresponding GAAP measures generally is not available without unreasonable effort. The Pooling and Sharing Debate By Howard Wheeldon, FRAeS, Wheeldon Strategic Advisory Ltd.